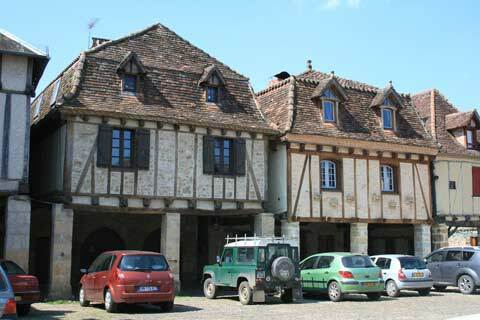 Bretenoux is in the Lot department close to the Dordogne border. 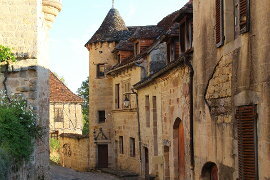 It is a small bastide town sat on the confluence of the rivers Cère and Dordogne. 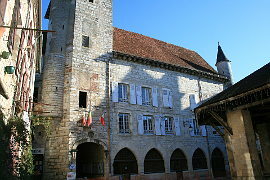 Bretenoux is a small bastide town with a cobbled square surrounded by pretty 13th century buildings some with arcades. There is a 16th century town hall and the attractive Consuls house with its pointed turrets to see. The town square is called the Place des Consuls. 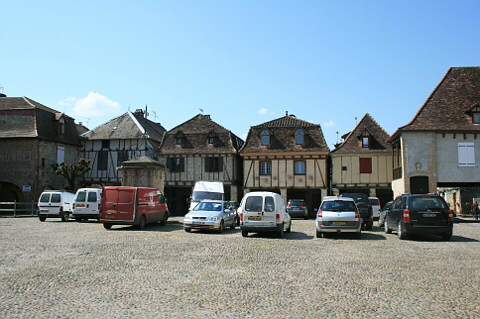 Sadly despite some very attractive houses the large cobbled square is used as a car park for the village and without a central halle (present in lots of the bastide towns) to detract from this it falls short of the attractiveness of many of the bastides. Visit on a Tuesday or a Saturday morning however and the square is filled with colourful market stalls rather than cars and you can see the town at its best. There are a couple of nice looking bars and restaurants on the square if you are looking for somewhere to stop for lunch or a drink. 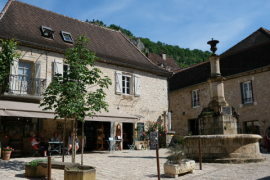 Alternatively head to Bretenoux on a Tuesday night in July and August and Bretenoux makes the most of its riverside position with night markets where you can sit and eat on the quais along the river edge - a lovely setting for a meal al-fresco. 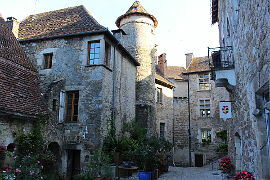 Bretenoux is a walled town and sits beneath the Chateau of Castelnau-Bretenoux, a chateau originating from the 12th century and one time home to Jean Mouliérat who restored the castle in the 19th century. 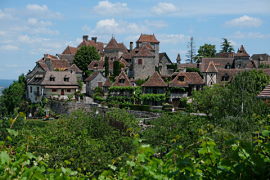 The view of the Chateau on top of the hill above Bretenoux is a splendid one. You can visit the castle. It has seven rooms open to the public, all of which have been decorated and furnished in medieval style. The castle itself is very impressive and has thick defensive walls and nine towers. 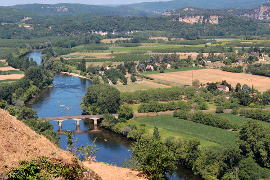 Sitting on the confluence of the Cère river and the Dordogne river opens up various activities such as fishing and canoeing and there is also an island - the Isle de la Bourgnatelle which is a perfect spot for a picnic. If you find yourself nearby on a night-time a few of the villages between the Cere river and the Dordogne river, including Bretenoux, are illuminated at night giving them a whole different atmosphere. 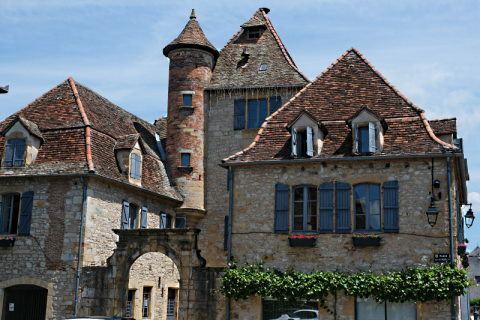 Bretenoux is actually in the Lot department but sits in Dordogne valley. 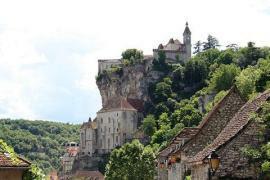 Close to Bretenoux are the 'most beautiful villages' of Loubressac, Autoire and Curemonte. 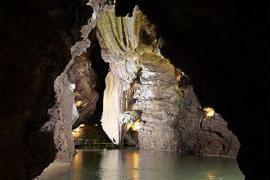 Visit Copeyre-Quercyland at Souillac which is an aqua park with other activities such as canoeing, a tree-adventure park and a spa.